These are not true ferns but are in fact members of the Lily family. The needle-like 'leaves' are actually called cladodes which perform the process of photosynthesis. The actual leaves are tiny and scale-like, appearing where the cladode meets the stem. 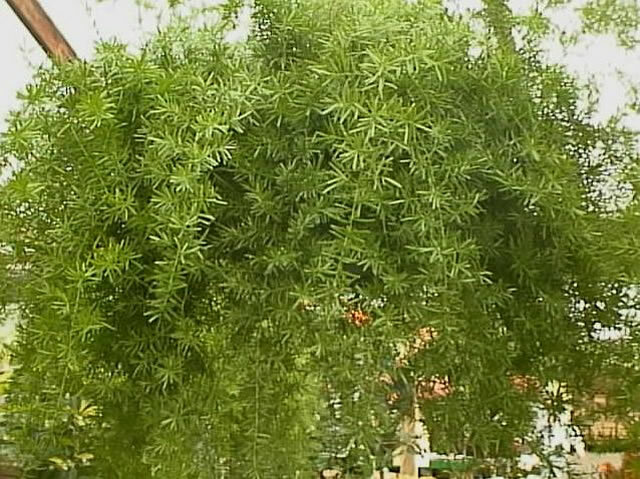 All parts of the Asparagus Fern should be considered toxic when ingested. Contact with the foliage may cause skin irritation. whether they are grown in the garden or in containers, as house plants. They grow best in bright, indirect light without any full sun. Direct, hot sunlight can scorch the 'needles', while insufficient light will often cause them to yellow or drop. They thrive in daytime temperatures of 70°-75° with it 10° cooler at night. Asparagus Ferns should be planted in rich, light, slightly acidic, well-drained soil. The addition of peat moss to a good, commercial potting soil will take care of this requirement. 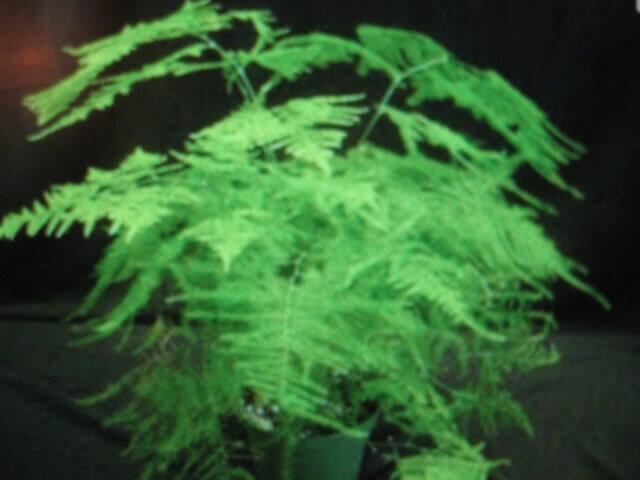 While Asparagus Ferns will tolerate short periods of drought, they grow best when they are given plenty of water, especially when they are actively growing. In low light conditions, your Asparagus Fern will need less water, especially during the winter months. They appreciate higher humidity and an occasional misting, but this is a case where they 'appreciate' it, more that they NEED it. using a soluble (liquid) all-purpose fertilizer. Continue with this feeding schedule until growth slows in the fall. Asparagus Ferns develop large tuberous roots and can become potbound in a relatively short period of time. They will often put out more growth and flowers after they become rootbound but will dry out far quicker and will need more frequent watering or thorough drenchings. It is a good idea to re-pot established plants in the spring before new growth begins, every 3 to 4 years. Under proper conditions, Asparagus Ferns will produce lots of vigorous, evergreen growth at all times of the year. If pruning becomes necessary, it is best to cut entire stems back to the base of the plant rather than just shortening them. 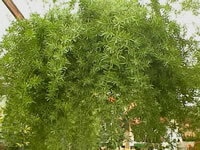 Asparagus Ferns enjoy spending the summer outdoors in the shade of a tree, but the transition from outside to an inside environment can be quite traumatic for many plants, depending on the degree of change in light and temperature. Acclimatize them gradually from one environment to the next over a 2-3 week span. Be sure to inspect them very carefully BEFORE bringing them back indoors, and regularly thereafter. Asparagus Ferns are very prone to spider mites, scale insects and mealybugs. If an infestation has gotten out of control, you can cut off all of the stems back to the soil line and discard the infested foliage. New stems will then grow back from the bulbs. Asparagus ferns can develop yellow needles for many different reasons, including a change in light, rapid temperature change, over watering, under watering, and spider mites. New growth will usually quickly resume as soon as the cause of distress is resolved. The easiest and fastest way to propagate new Asparagus Ferns is by division. The root ball can be sliced into half or quarter sections with a sharp knife or pulling the tubers apart by hand and repotting into smaller planters. Asparagus Sprengeri produces small bulblets which can be planted individually as well. Asparagus Ferns are dioecious plants, meaning that both male and female plants must be present to produce. If your plant has berries on it, you can harvest a single seed from each one. Remove the pulp from the seed and soak it room temperature water overnight before sowing them indoors ½" deep in a tray or in pots. Maintain a temperature in the planting medium at 70°-80° until germination, which takes about 4 weeks. For the best results, Protasparagus seeds should be sown while fresh. Sprenger's Asparagus is a branching perennial with wirey green stems that are sparsely covered with clusters of 3-4, ¾" cladodes along the stem. They can be trained to scramble up a support, but are most often grown as hanging plants. Produces small white or pinkish-white flowers in the spring, followed by green berries that will turn red by mid-winter. Sprenger's Asparagus has been declared a noxious weed in Florida, Hawaii and New Zealand. Foxtail Ferns produces arching two foot 'fronds' of dense light green needles, creating the illusion of a pack of upright fox tails. Tiny white flowers in the summer are followed by bright red berries in the fall. Foxtail Ferns are very similar to Sprenger's Asparagus except the growth habit is much denser. In the garden they will grow 2 ft. tall with a spread of 3 to 4 feet. 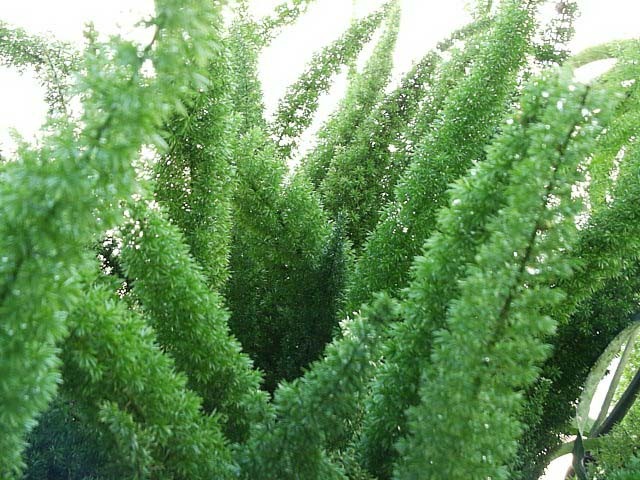 The Asparagus Fern is a very popular plant for florists who commonly use the lacy, horizontal fronds in flower arrangements. These decorative vines will grow up to 10 feet with support, or they can be kept to a more compact size by regularly removing the tips from new growth. Tiny, inconspicuous white flowers in the summer are followed by clusters of small, black berries.